We use extensive incoherent scatter radar observations made at the Jicamarca Radio Observatory between 1970 and 2003 to study and model empirically the equatorial zonal plasma drifts near the F region peak using Bernstein polynomials as base functions. Our quiet-time model results confirm that the daytime drifts are westward and are nearly season and solar cycle independent. The nighttime drifts are eastward, have larger magnitudes, and increase strongly with solar flux, particularly near equinox and December solstice. Enhanced geomagnetic activity drives small eastward perturbation drifts during the day and much larger westward disturbance drifts at night. The nighttime drift perturbations are largest near midnight and increase strongly with solar flux near equinox and December solstice but are essentially absent near June solstice. The Jicamarca zonal disturbance drifts can be largely accounted for by disturbance dynamo electric fields with a dominant time delay of about 3–15 hours following enhanced geomagnetic activity. In the postmidnight sector, there are also smaller westward disturbance drifts associated with time delays of about 15–24 hours and perhaps even longer. Our results strongly suggest that the longitudinal dependence of both the quiet and disturbed equatorial nighttime zonal drifts varies with season. 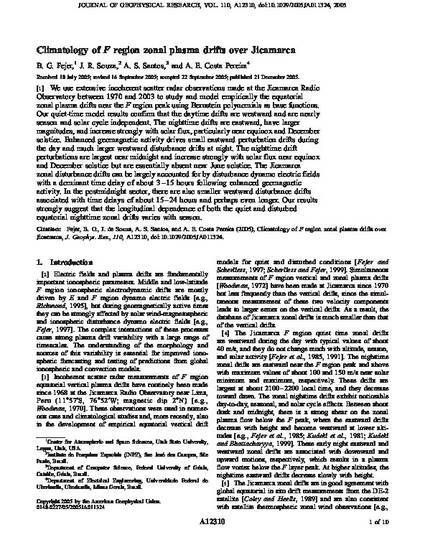 Fejer, B. G., J. R. Souza, A. S. Santos, and A. E. Costa Pereira, Climatology of F region zonal plasma drifts over Jicamarca, J. Geophys. Res., 110, A12310, doi:10.1029/ 2005JA011324, 2005.